Photo Resizer is a Free Batch Picture Resizer that can be used to resize single .jpg images or entire image directories by simply dragging and dropping them onto the executable. 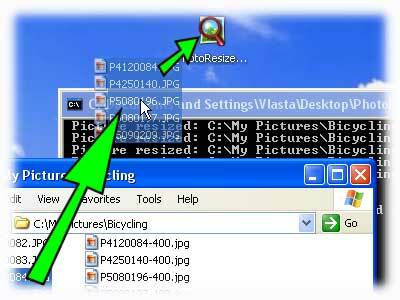 All options can be set by the name of the program, making it easy to have custom versions of the executable for specific image resizing (example: photoresize400.exe, photoresize600Q90.exe). New picture names are based on the original names, appending a suffix indicating their size (example: mycar-400.jpg.